We are printing on rotary printing machines Buser and on Stork (newest generation) and in almost unlimited numbers of colors with pigment and reactive dyes on cotton or linen fabrics up to width 180 cm. Single designs is possible to combine in many color variations. We have wide range of our own designs or we can make designs by customers wish. Minimum quantity for order is 600 metres by every color variation. The producing term is approx 3 – 4 weeks after confirmation of order. We are printing on digital printers JP6 and JP7 of MS Saronno/Italy with reactive dyes on cotton fabrics to width 180 cm. In digital print is no limitation in number of colors. Best excel photographic designs. Minimum quantity for order is 120 metres by each file/colorway. The producing term is approx 3 - 4 weeks after the confirmation of order. We dye wide range of color shades by customers request. We use healthy pigmenst, reactives and vat dyes. Ready fabrics are resistant chlorine-washing and suitable to medical. Minimum quantity for order is 500 metres per each color. The producing term is approx 3 - 4 weeks after confirmation of order. 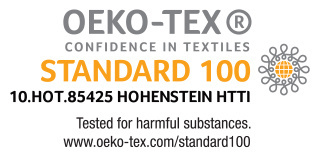 We are holders of certificate Oeko Tex Standard 100 Class I. for pigment and reactive prints.